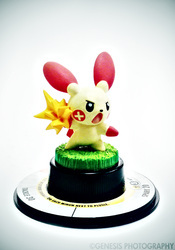 The Pokemon Trading Figure Game, or Pokemon TFG as it is more popularly known, is a two-player game that features detailed miniature figures of Pokemon battling their way to land on the opponent's goal. It was first released in Europe, Australia and Southeast Asia in fall 2006 and later in America and Japan in 2007. Next Quest was the only expansion set officially released due to the series being discontinued in 2009. There are supposed to be two other planned sets for release with some of the figures leaking unofficially. Groundbreakers, the second set, was supposed to be released before its untimely cancellation. Starter sets were even distributed to retailers which is why 8 figures from this set were still considered "officially" released. Meanwhile, the 3rd planned set for the series started to appear in eBay and other dodgy sites causing some collectors to think that they are fake. However, closer inspection revealed that these figures are very much the same as the other sets and might have been in production even before the game was cancelled. This website will refer to the third set by the name of Mystery due to its mysterious roots. 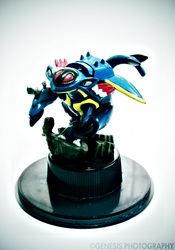 Every set has 42 figures in total, with 38 different Pokemon and 4 trainers that comprises the set. Most of the figures feature Pokemon from the first 3 generations while some Pokemon from the 4th generation are featured as bonus figures. 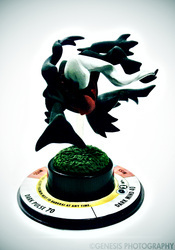 The figures are placed on a round base where the attacks are and to play them players must attach a plate at the base to make them spin. Basically, you spin the figures when they meet in the field to see which attacks they will use. The goal of the game is to land first on the Goal space of the opponent using your Pokemon. Trainer figures are used when Trainer Cards (similar to that of TCG) are being utilized. 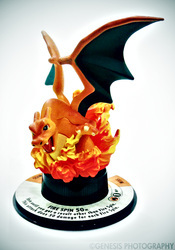 Each expansion set is supposed to have 2 starter sets that include 3 Pokemon figures with one Trainer figure with spinning bases. A two-sided playmat, a figure checklist and a how-to-play guide are also included together with 3 Trainer cards. Only the first expansion set has officially released starter sets but the second set was supposed to have them too if not for the cancellation before its release. Booster packs are also available for the first set with varying packaging, some containing 1, 2, or 3 figures. Special pearl and crystal figures are also available as secret rares in booster packs for the first set.